Manchester Airports Group: STEM Resources & Competitions! Building on the success of their Secondary Dragons’ Den competition Manchester Airports Group have developed a Primary Apprentice Competition which will be open to up to 20 schools. They also have numerous STEM resources available as part of their new outreach. 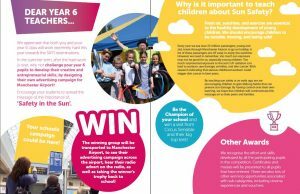 Teachers can follow a free ‘teacher pack’ and a series of videos to deliver the Apprentice Competition lessons and the challenge is to design an advertising campaign under the theme ‘Safety in the Sun’. The winning school will win a ‘whole school prize’ and their campaign will be on display in the airport. Register your interest now by emailing [email protected] to secure 1 of the 20 places. Every year students from high schools in Greater Manchester and Cheshire are recognised by business leaders at Manchester Airport, whilst completing a Dragons Den-style enterprise competition. Competing schools from across the North West are challenged to develop a gift for family or friends retailing for £5 or less. The teams set themselves up as a virtual business; design a gift, work out how to manufacture it , purchase materials, market and sell the product and produce accounts. There are opportunities to develop key skills for each team member. Businesses that are members of the Airport Community Network provide mentors to each of the participating schools, supporting the teams and encourage them throughout the process, along with a business set-up loan of £100, which schools had to pitch for in a presentation to the Dragons in The Den. Once the loan is secured students are encouraged to go and sell their product. The winning team that is the team that has raised the most money. A team of pupils from Wilmslow High School won the overall prize in 2016, making more than £2,400! A total of over £8,000 profit was made by all of the schools who took part, which was shared between St Ann’s Hospice, the Royal Manchester Childrens Hospital and East Cheshire Hospice. The initiative has been taking place since 2009 and an astonishing £55,000 has been raised during that time. The new ‘revamped’ competition is coming soon for 2017! Manchester Airports Group have produced a number of new and free resources for teachers of Key Stages 1-3 and BTEC. The new teaching packs focus on Geography and Maths whilst giving pupils an overview of the airport’s operations. There will be new Science ‘Forces’ resources added next year. The airport has also offered job shadowing and World of Work days. Awesome!